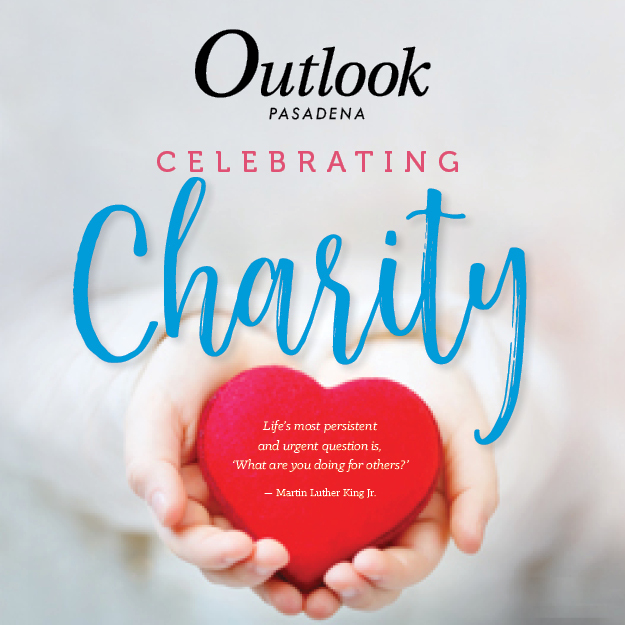 Ensuring students’ mental and emotional health as part of their overall safety, allocating money from bond measures and retaining accreditation for La Cañada High School were key goals that gained the approval of the La Cañada Unified School District Governing Board on Tuesday night. 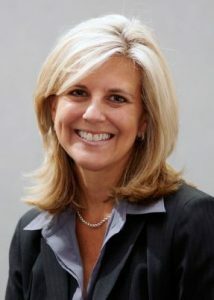 Superintendent Wendy Sinnette, who presented the goals for the academic year, said she and the board had worked on them since July, adding that they incorporated ideas that came from subcommittees. 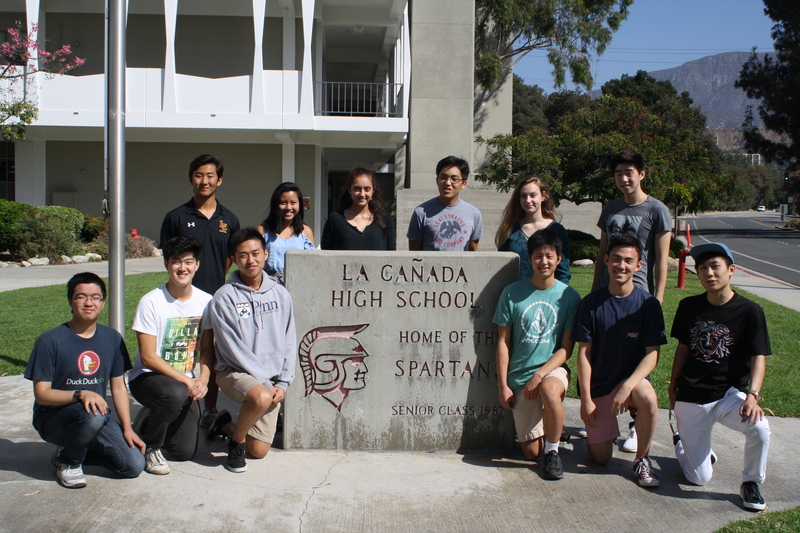 La Cañada High School seniors who recently became National Merit Scholarship Program semifinalists include Kevin Mo (front row, from left), Kyle Lee, Jared Cheng, Harrison Cho, Andrew Kwon and Justin Hyon. Back: Ryan Choi, Amanda Laus, Diya Razdan, Jared Ahn, Veronica Muller and Andrew Chae. The 12 La Cañada High School seniors named semifinalists in the prestigious National Merit Scholarship Program recently had some tasty treats — think small cartons of orange juice, blueberry muffins and Smarties — to recognize their talents. But they could be in line for a greater award. Students who were honored recently included Jared Ahn, Andrew Chae, Jared Cheng, Harrison Cho, Ryan Choi, Justin Hyon, Andrew Kwon, Amanda Laus, Kyle Lee, Kevin Mo, Veronica Muller and Diya Razdan. They are among approximately 16,000 semifinalists nationwide, or less than 1% of U.S. high school seniors, according to an announcement from National Merit Scholarship Program. The semifinalists, who include the highest-scoring entrants in each state, took the 2017 Preliminary SAT/National Merit Scholarship Qualifying Test, according to the release. Those who later become finalists would be eligible for scholarships through the program and other sources. 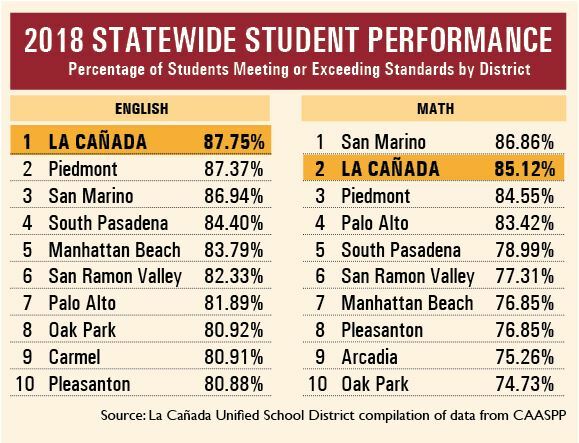 The La Cañada Unified School District long has enjoyed a solid reputation for academics, and now a review website has ranked the system’s elementary schools among the best in Los Angeles County. 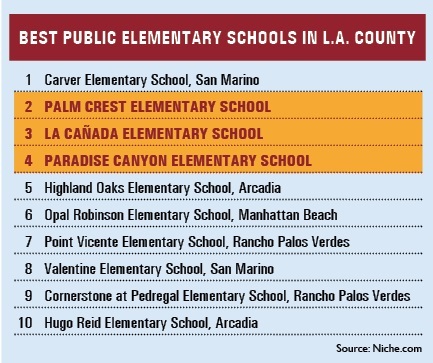 Palm Crest Elementary School ranked No. 2, La Cañada Elementary School was No. 3 and Paradise Canyon Elementary landed at No. 4 among public schools in the county, according to Niche.com. No. 1 was Carver Elementary School in San Marino. Last year, Palm Crest ranked No. 4, with La Cañada at No. 5 and Paradise Canyon finishing at No. 9. It was a long game between the La Cañada High School varsity football team and New Design Watts of Los Angeles last Friday. Penalties and injuries often stopped the clock, making the first half last 1 hour, 34 minutes. But the Spartan players and coaches relished every single minute of it. For the first time in nearly two years, they knew the feeling of building a lead and maintaining it for a victory. Not only did the Spartans earn it, but they deserved it with their attitude the past year despite being on the wrong side of the history of the program. 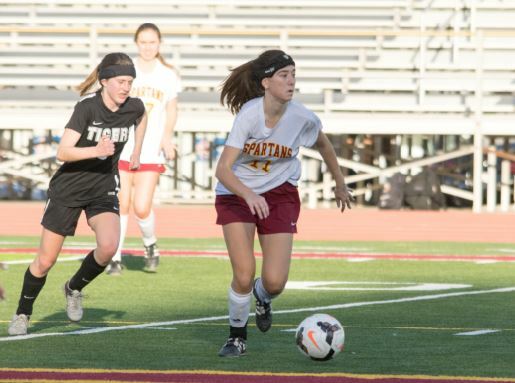 La Cañada lost a record 14 consecutive games before defeating New Design Watts, 37-6, but the players always kept their heads up and battled, regardless of the score. 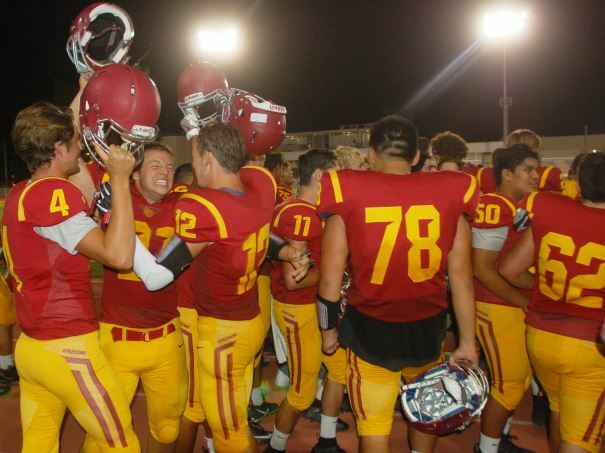 Matt Bromley, Jacob Hardy and Dezin Delgatty celebrate La Cañada’s first victory since the Spartans’ 28-13 win over San Marino on Nov. 4, 2016. The La Cañada High School varsity football team was determined to end its losing streak, and its resolve showed on the opening kickoff against visiting New Design Watts of Los Angeles last Friday. Dezin Delgatty returned a pooch kick 57 yards for a touchdown, giving the Spartans a lead that they wouldn’t relinquish in a 37-6 nonleague victory last Friday. Jason Sarceda finally picked up his first win as LCHS head coach and snapped a 14-game losing streak that plagued the program. James Cartnal, executive director of Pupil and Personnel Programs and Services, shows youths how to work with tools at the STEAM night on Monday. The educational concept known as STEAM is, in large part, about giving students the tools to excel in science and technology. 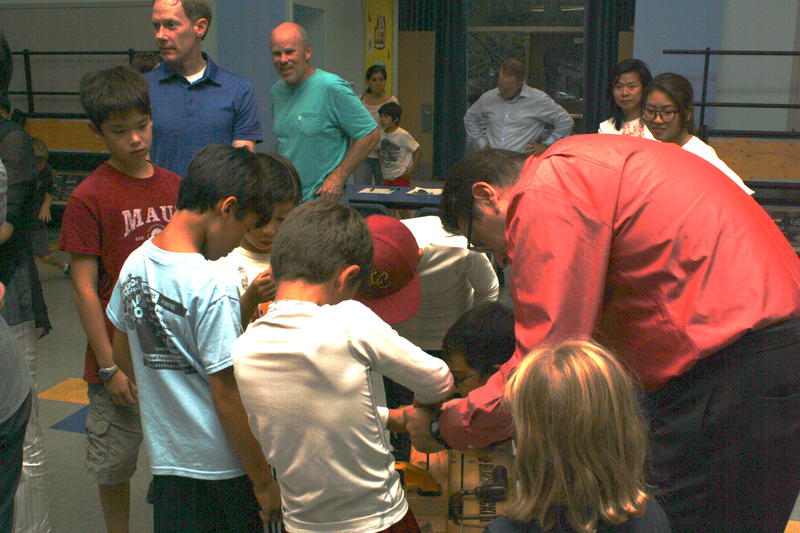 So it seemed appropriate that hand drills, saws and other implements figured prominently in the La Cañada Unified School District’s first system-wide STEAM night of the academic year. 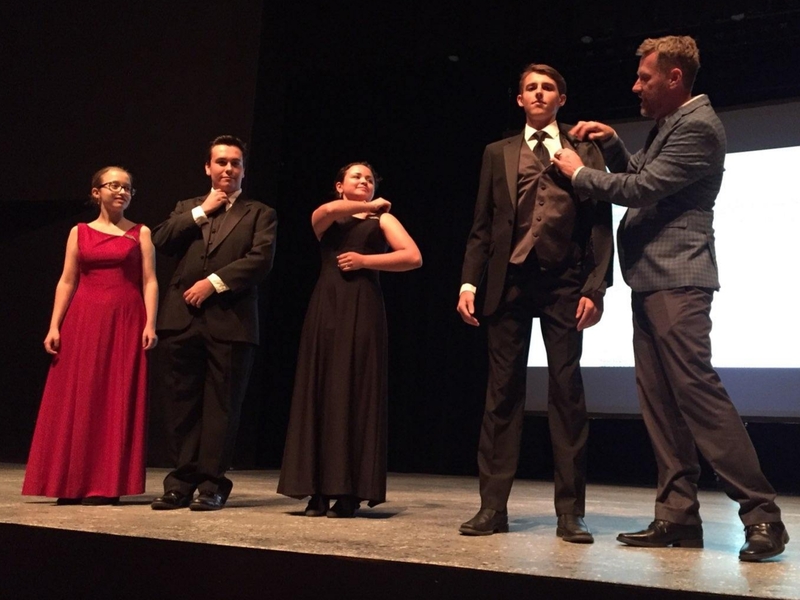 Ashley Knutson, Matthew Baker, Ellie Chapman, Logan Boggs III and La Cañada High School Choral Music Department director and conductor Jeff Brookey attend a late August parent meeting. Brookey is showing parents how the wardrobe for the concerts must be worn. Years from now, when senior Shalini Pullarkat looks back at her three-year tenure in the La Cañada High School choral music department, she’ll vividly remember the feeling of sheer awe while singing in the Vatican’s Sistine Chapel. And though the trip may be one of the highlights of her choral experience, Pullarkat knows she’ll also remember the group for its tightknit closeness, a key to the program’s resounding success of 50-some years.